Your teaching guided me through correct pronunciation and helped me know exactly what my problems are in English pronunciation. Now I am so confident in my English pronunciation. I wish I knew about this program earlier. Your course has taught me a lot and has been a superb eye-opener. I think you should have charged me more as I feel I have certainly obtained significant value for the money. I recognize the time you must have taken to listen to my recordings and make all those pertinent comments and recommendations (something simply not available on the off-the-shelf books and CD-ROMs) and which have been essential to my progress. Some people believe that they can improve their accent just by practicing with a self-taught method. Unfortunately, this is not possible. It is absolutely crucial to have a very qualified professional to detect what your sound errors are, show you what you are doing wrong and what you should do to produce the sounds correctly. Otherwise, you might just reinforce your mistakes. I had had contact with other speech pathologists before choosing EnglishWithoutAccent.com and felt that they would not be able to help me because of their approach. The speech pathologist at EWA totally understands all the aspects involved in the production of sounds and is aware that people are different. Because of that, she adjusts her method to the client’s difficulties and needs. I was also very glad as she provided feedback on some aspects of my speech which I was not even expecting to be included in the course. It could not have been better! After a long time I finally found this wonderfully structured course which was based on my needs. It has improved my pronunciation, intonation and accent of my speech which makes me more comfortable at work. Now I feel more confident while talking to others especially with doctors, patients and co-workers. 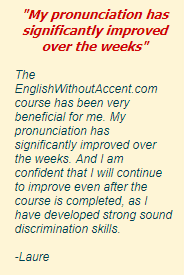 I’d definitely recommend Lori Edwards to others who interested in improving their accent. 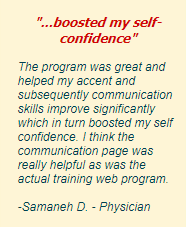 Taking the accent reduction course was one of the most useful investments in my education. The course was extremely helpful. It helped me understand my errors and get the correct pronunciation. This will have long lasting effect even though I don’t live in an English-speaking country. Lori, my instructor was patient, knowledgeable and fun to work with. Thanks!